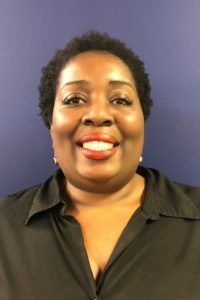 Charlotte native, Constance Mitchell, has been a notable member of the Goodwill Industries team serving a decade in Employment Skills Training and is approaching four years with GoodWork Staffing. Constance’s various roles within the banking and insurance industry prior to Goodwill have set a viable foundation leading to over 30 years of quality customer service, which greatly aids in her current success in payroll and invoicing. Prior to being on the GoodWork Staffing team, Constance took her personal love for art and transformed it into a therapeutic and lucrative outlet for the Goodwill clients she served. By building a partnership with the Charlotte Art League, clients were able to learn an assortment of art forms, many of which were taught by Constance. The Second Helping mosaic sign, located in the break room of Goodwill’s former facility, was designed and created by Constance as an extension of what she taught in her art class. Constance also taught clients to garden and job skills that improved their independence and self-esteem. The partnerships Constance built with multiple soup kitchens and Crisis Assistance Ministries created volunteer opportunities and built lifelong relationships with all parties involved. Spending time with family is Constance’s favorite pastime. If she is too quiet, you are more than likely to find her studying and practicing for one of the art classes she takes at CPCC or looking for antiques at garage sales and consignment shops.